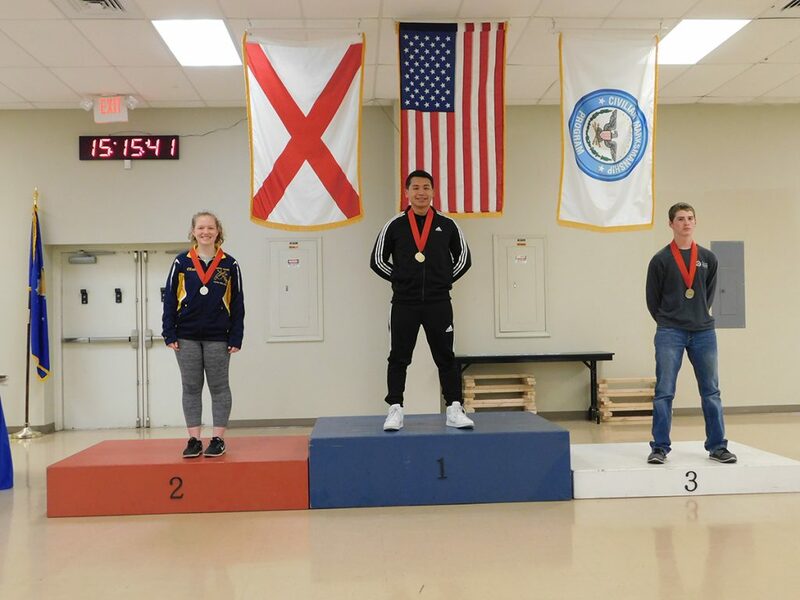 ANNISTON, Ala. – At the 2018 Dixie Double air gun match in Alabama, Sagen Maddalena, 25, of Groveland, CA, fired a score of 1262.1 to claim the overall rifle aggregate – just one point above Ivan Roe, 22, of Manhattan, MT, who recorded a score of 1261.5 for second. Roe managed to squeak just passed Rosemary Kramer, 21, of Statesboro, GA, who followed tightly in third with 1261.1. 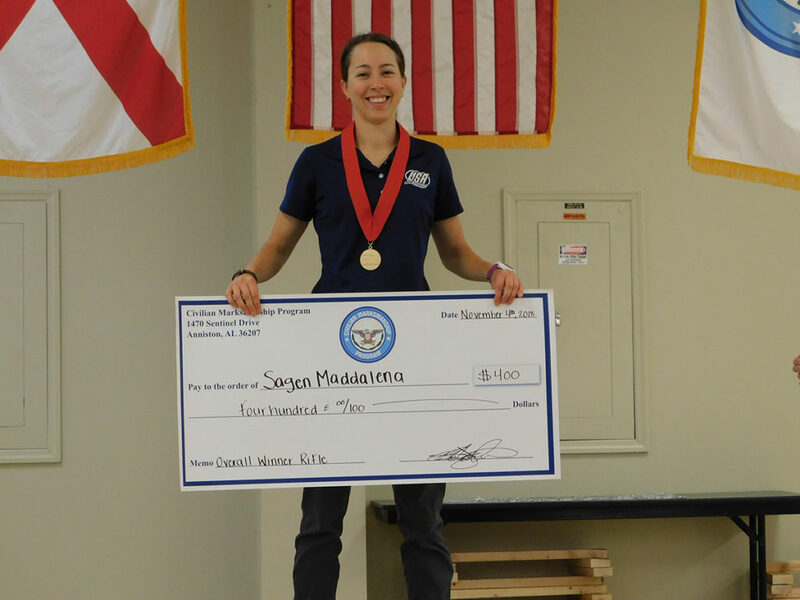 Sagen Maddalena was the overall winner of the Open Rifle competition. 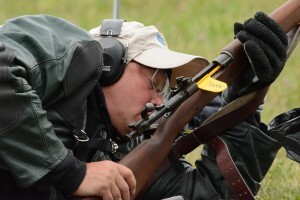 The trio of tough competitors fired alongside some of the best men, women and junior competitors from around the country, including members of the Army Marksmanship Unit and other national-level athletes that are always in attendance at the annual competition. 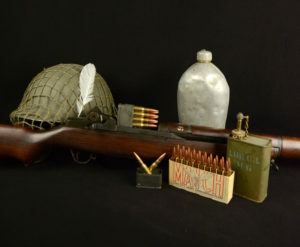 Held each fall, the Dixie Double event serves as a learning opportunity for upcoming shooters as well as a worthwhile challenge for experienced marksmen. 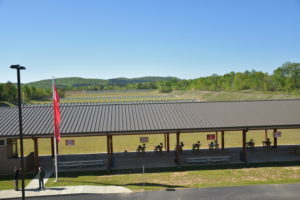 The two-day 60 shot international rifle and pistol competition is designed for both adults and juniors, with an Open and Junior match fired simultaneously, as well as a final to end each day. A two-person aggregate team event, which combines the skills of an adult and junior competitor, is also held concurrently with competition. Overall competitors are awarded each day, with overall winners calculated from the combined, two-day aggregate scores. 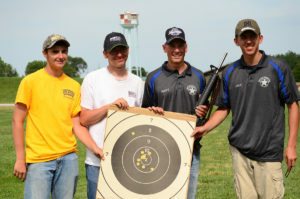 Matthew Sanchez, Gavin Barnick and Claire O’Neel led the field of over 60 juniors in the rifle match. 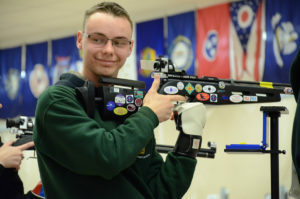 After finishing in second at last year’s Dixie Double, Matthew Sanchez, 16, of Tampa, FL, improved his performance to become the overall competitor in the junior rifle aggregate, racking up a score of 1238.6. Sanchez led the match by nearly 10 points above second place finisher Gavin Barnick, 15, of Mora, MN, who recorded a score of 1229.9. Claire O’Neel, 17, of Frederick, MD, took the third place position by only one-tenth of a point, with a score of 1224.9. Juniors Zachary Miller (left) and Hunter Battig (right) led in the overall Pistol matchup. 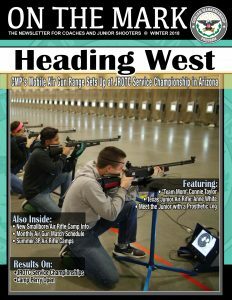 In pistol, Hunter Battig, 16, of Colorado Springs, CO, fired a score of 1125-27x to claim the overall win in the aggregate competition. 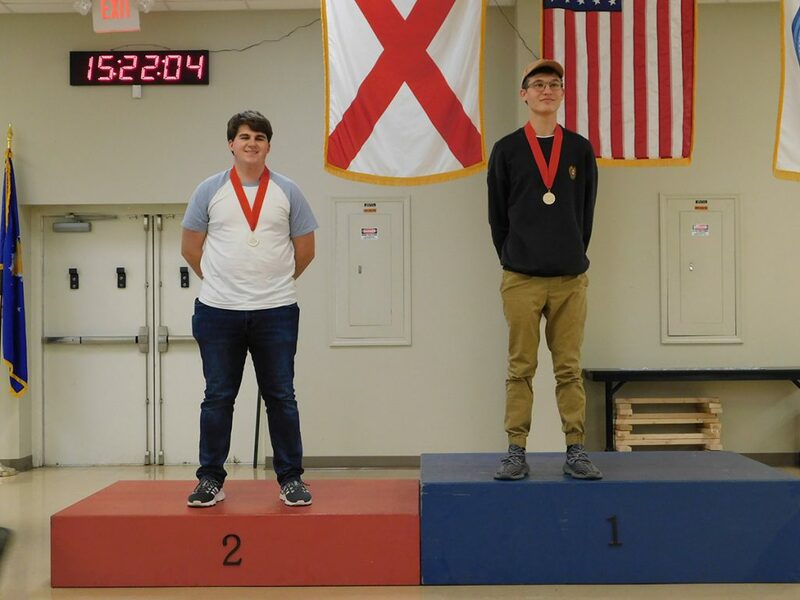 Kara Petracek, 40, of Atlanta, GA, fired a score of 1122-21x for second in the match, as Zachary Miller, 18, of Sylacauga, AL, took the third place spot with a score of 1121-18x. 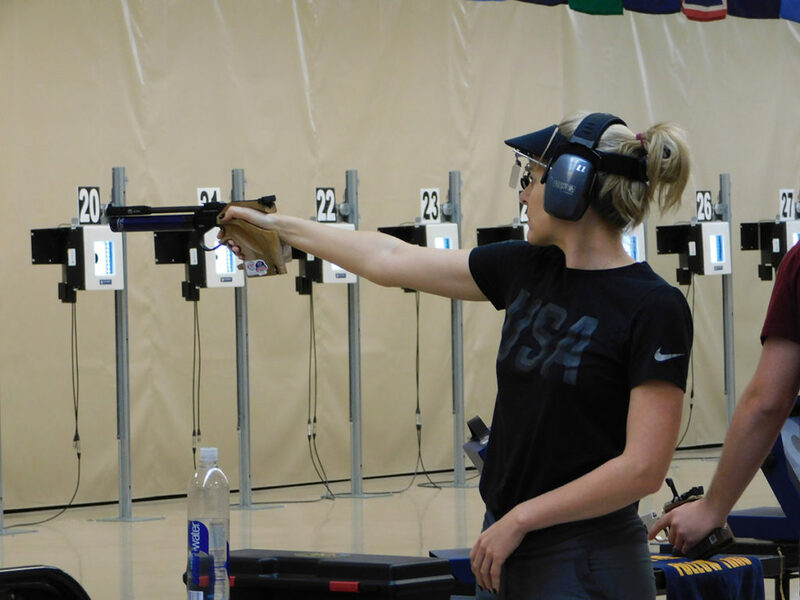 Kara Petracek earned second place overall in the Open Pistol event. In pistol team action, only two teams competed, with team Cheating on Katelyn & James (Zachary Miller and Kara Petracek) besting The Old New Team (Hunter Battig and Colonel Bruce Meredith) with a score of 2218-39x to their opponent’s 2147-34x. 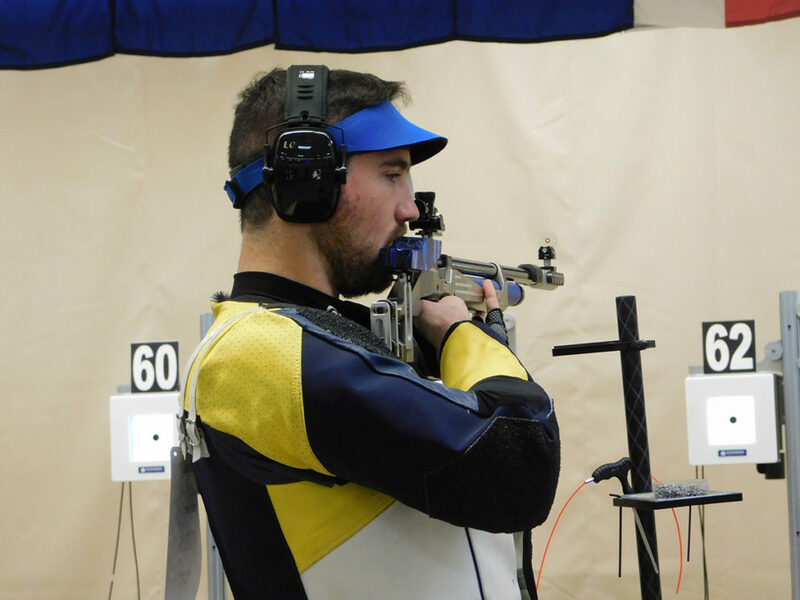 Sagen Maddalena and Scott Rockett joined forces to overtake the Rifle Team Match. 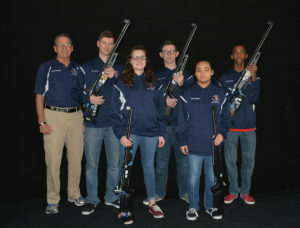 The rifle team of Wheaties Box Rejects (Sagen Maddalena and Scott Rockett) led the rifle team competition with a score of 2474, a full 10 points above What Do You Mean, a Team Name? (Ivan Roe and Douglas McWhorter), with 2464. Team S & S (PVT Emily Stith and Savanna Stainaker) followed just behind in third, with a combined score of 2449. 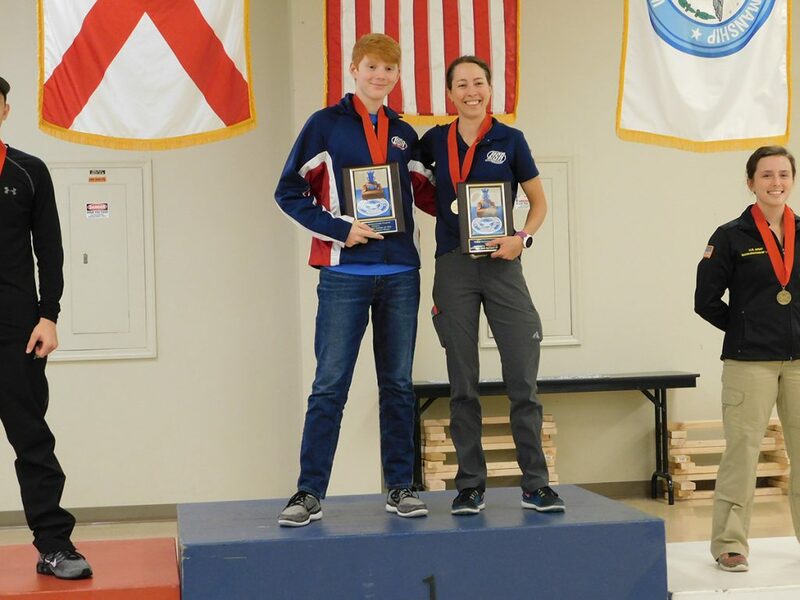 The Target Sprint event returned to the Dixie Double in 2018 to the delight of guests and competitors. 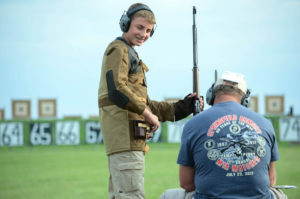 Returning to the Dixie Double in 2018 was the Target Sprint competition, which welcomes individuals ages 10 and up who have completed a basic rifle safety class. 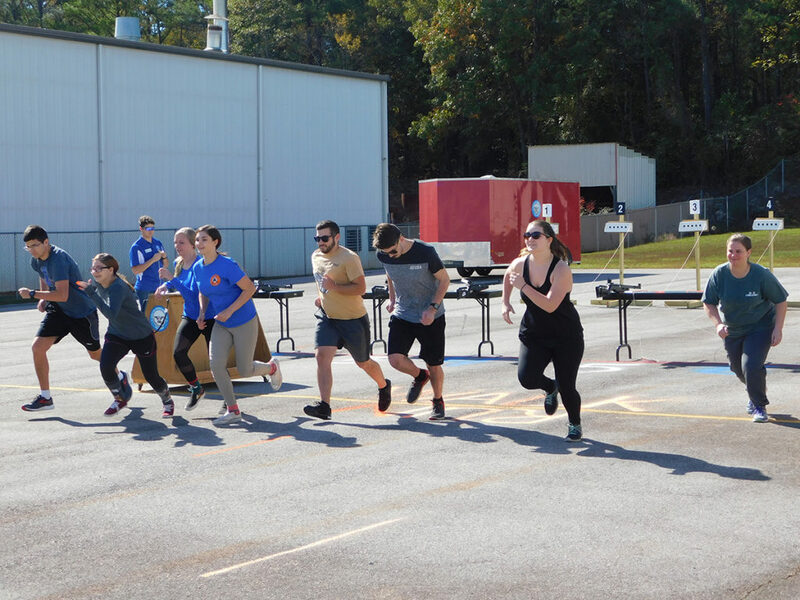 During the event, participants run along a path, occasionally stopping to fire air rifles at five 10-meter collapsible targets, knocking all over before continuing on to run another lap. The first to cross the finish line is declared the winner. 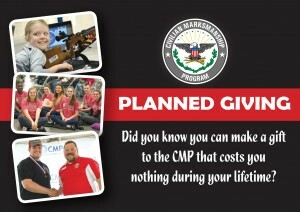 This year’s leading competitor with the best completion time was CMP’s own Chance Cover. Congratulations! 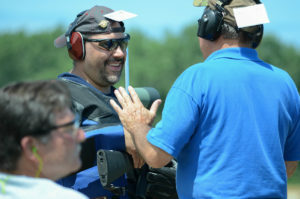 CMP’s Chance Cover was the winner of the resurrected Target Sprint event. 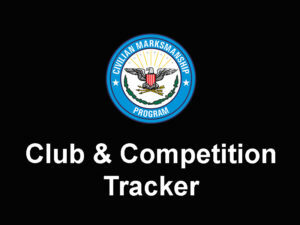 For a complete list of results, visit the CMP Competition Tracker page at https://ct.thecmp.org/app/v1/index.php?do=match&task=edit&tab=results&match=17412. Photos are available for free download from the CMP Zenfolio page: https://cmp1.zenfolio.com/p543121374.